If you follow along here regularly you know we have been featuring different grief theories every few weeks. Wait, don’t shut your browser! I know, grief theory doesn’t sound like the most exciting topic. But it really is pretty darn interesting and relevant. When we are grieving we often feel crazy and want to know if that is normal. We are in so much pain and we want to know if it will ever end. We feel utterly alone and like no one can possibly imagine our pain. We wonder what we can possibly do to feel better. Grief theories are the academic way to answer those questions. They can, on a good day, give some semblance of rhyme, reason, and direction to the grief process. The unfortunate news is that, with the exception of Kubler-Ross’s five stages of grief model, most regular grievers have no idea what these theories say. What have you missed in our series? Well, we started with five things you should know about the five stages. We followed that up with Worden’s theory, the Four Tasks of Mourning. Today we are talking about a grief theory from Dr. Theresa Rando, who you may know from her book How To Go On Living When Someone You Love Dies . She’s made the media rounds over the years – the Today Show, Oprah, Dateline, the New York Times, the Washington post, etc. Disclaimer: though everyone has heard of Kubler-Ross, and Rando has quite the list of publications and media appearances, and Worden has a fan club of followers, it is important to keep in mind that all of these theories are just that: theories. There is evidence for and there is evidence against. These theorists sometimes agree with one another and sometimes they don’t. Some we love. Some we kinda like. Some we could give or take. But, just as we all grieve differently, we will all relate to these theories differently. If you don’t relate to one particular model it doesn’t mean you are grieving wrong, that you are weird, or crazy. If you are worried that your grief is abnormal or that you need some professional help you can check out our post on seeking help. We could all benefit from a little therapy. Really. Ok, back to Rando. Though the five stages is the model pop-culture knows and loves, Rando’s model is pretty catchy – The Six R Processes of Mourning. Similar to Worden’s tasks, Rando conceptualizes :processes” that one must accomplish throughout the phases of mourning. Though a similar concept to tasks, for me this language shift to “processes” gives a greater sense of fluidity, complexity, and extended time frames for completion. Each of her processes starts with . . . wait for it . . . the letter R. The processes are broken down within three phases of the mourning. Don’t worry, it sounds complicated but it really isn’t. Let’s start with the phases. Rando suggests her six Rs fall within three phases of mourning. It is important to note that Rando is careful to differentiate grief from mourning. Her description of grief is more an involuntary reaction to the loss, whereas mourning in an ongoing, active process of moving toward accommodation. The three phases of mourning are the avoidance phase, the confrontation phase, and the accommodation phase. During each phase there are certain “R” processes that are accomplished. 1) Recognize the loss: this means acknowledging the death and understanding the death. This occurs in the avoidance phase. 2) React to the separation: this process involves experiencing the pain, feeling, identifying, accepting, and expressing reactions to the loss. It includes identifying and reacting to secondary losses. This occurs in the confrontation phase. 3) Recollect and re-experience the deceased and the relationship: this requires realistically reviewing and remembering the deceased, as well as reviving and re-experiencing feelings. This occurs in the confrontation phase. 4) Relinquish old attachments to the deceased and the old assumptive world: this occurs in the confrontation phase. 5) Readjust to move adaptively into the new world without forgetting the old world: this means developing a new relationship to the person who dies, adopting new ways of being in the world, and establishing a new identity. This occurs in the accommodation phase. 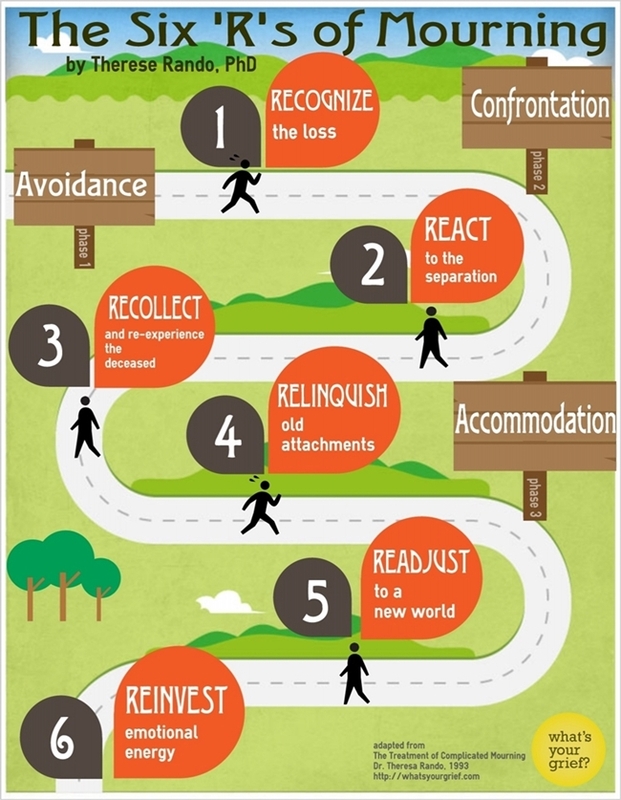 6) Reinvest. This means putting emotional energy into new people, goals, etc. This occurs in the accommodation phase. For Rando a ‘normal’ mourning will mean successfully completing the above processes. Some important things to keep in mind – for Rando, recognizing the loss means understanding what caused the loss, in addition to accepting the reality of the loss. That understanding can be especially difficult with certain types of losses, especially suicides, overdoses, and other disenfranchised deaths. Reacting to the loss means not only feeling, identifying, accepting, and expressing reactions to the loss, but also identifying and expressing reactions to any secondary losses associated with the death. This could be the loss of financial security, loss of a role (wife, mother, sibling), or loss of faith in God, human nature, etc. The impact of these secondary losses can often be ignored or underestimated, but must be addressed as part of the reaction process. The third R, recollecting and re-experiencing the deceased, is an important step for incorporating memories into the present, as the memories will become an important part of integrating your relationship with the deceased into the present. An important point in this step is honestly recollecting, addressing the good and bad of the memories and relationship. Relinquishing old attachments to the deceased and the old assumptive world is the next process, which (in my humble opinion) can sound harsh and unpleasant. The reality of this process is an acknowledgment that there are certain things that will need to be let go in order to move forward. Though the phrasing can sound like an abrupt severing, this is actually a process which takes place over an extended period of time and allows one to let go of things while becoming comfortable with the idea that they will be okay in a new world without the person who died. It is important to know this is not letting go of everything, but rather things that must be relinquished to continue moving forward toward a new world. Readjust to move adaptively into the new world without forgetting the old world is the next “R”, and it comes very naturally out of the fourth process. This is where a griever has moved into the third phase, accommodation. Having relinquished attachments and become comfortable with the idea of existing in a new world without the deceased, this process allows one to establish a new identity in the world while still integrating and remembering the world before the death. This is an important time in which one must find new ways of being comfortable in the new world and establishing a new identity. This brings us to the last “R”, to reinvest. Though I hate this term, the idea is true to the name: one must ultimately invest emotional energy into new people, goals, and life experiences in the new world without the deceased. I am not sure what puts me off about the word reinvest. Though this is not what she intends, something about the word makes me feel as though I am taking away all energy from remembering the person who has died and replacing it with something else. It is important to understand that for Rando the accommodation phase does not mean reinvesting to find things to replace the person who has died. Rather, it means creating space for new things while maintaining a space for a new and a different type of relationship with the deceased. Rando, like so many others, wants people to remember that the goal is learning to live with one’s loss; not to find some once-and-for-all “closure”. For Rando achieving recovery will mean integrating your loss into your life. It means assimilating the past into present. You can read here exactly how she views grief recovery. There it is in the most basic of nutshells. SOOOO . . . What do you think?? You love it? You hate it? You relate to it? Not so much? Whatever your thoughts leave a comment to let us know. Wondering where you can check this out in more detail? Rando’s book where she lays this theory is Treatment of Complicated Mourning . Not getting our updates by email? Clearly you don’t know what you’re missing. Sign up on the sidebar or below the comment box to subscribe. 11 responses on "Rando's Six R Processes of Mourning"
I think this information is so very helpful! I am a social worker at a Skilled Nursing Facility so therefor dealing with grief is a regular aspect of the work that I do. I feel especially passionate about helping family members deal with their grief and the many aspects of it. I think perhaps what resonates most with me is the emphasis I have read on there being no time limit on each of the phases/tasks of grief… and that in and of itself is very freeing. Personally, about 3 months ago tragically my 21yo daughter lost her best friend to suicide at the young age of 21 after having struggled for years with bipolar disorder. We miss M.C. everyday, and my heart goes out to my daughter and to M.C.’s family. Death impacts us all, whether it is an aged elder after a long illness for which we have anticipated her passing or if it is very unexpected and tragic for someone who had her whole life ahead of her. Grief is universal regardless of the circumstances. I think the more we continue to emphasize how “normal” all of the feelings are, the more we can help society in general. In talking about and exploring our feelings. In some way, doing so may help reinforce the importance and significance of the person we loved because that loved one had impacted our own lives. We can honor our loved one in some capacity by allowing ourselves to feel and experience all of the feelings that come in this experience of loss. If we had not had this person in our lives, we would not find ourselves feeling the loss we have. And this loss may invariably affect us in the same way that the relationship we had did affect us. The affect of our loved one goes on in how we process our grief. The step of “re=investing” is misnamed, imo. It should be called simply “Investing”. One can draw a parallel to what an adolescent needs to do in order to let go of their parents, to separate, and move forward into their own new lives, such that the adolescent isn’t ‘reinvesting’ energy into “new people, goals, and life experiences”, but is NEWLY investing their energy into those things, or adding more to the investments they’ve already begun. I find your work here very helpful. I am writing a pastoral care project for a D.Min. degree at United Theological Seminary and would like to cite your writing on the secition of the 6 R’s, which seems to be an excellent distillation of her writings in Grief, Dying, and Death. I there is any reason I should not do that, please let me know. Thanks. Also, could you let me know about the correct way to cite it..
Hi Richard, I am glad you found this post helpful. Please feel free to cite using standard APA guidelines for citing a web article. Best wishes with your project! Ah, so glad the site was able to help you out in a pinch! Hope your class went well.